An unfortunate accident left Jonathan with a very noticeable traumatic scar in the left eyebrow. Due to his active teenage lifestyle, camouflage makeup was not an option and permanent makeup (tatooing) would simply color the skin and wouldn’t address the large loss of eyebrow hair. 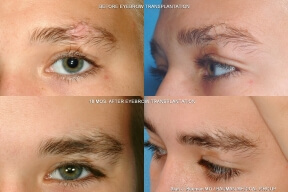 A single session of transplantation was performed by Dr. Bauman directly into the eyebrow scar using hundreds of single hair follicles harvested from the scalp. It is a common myth that scar tissue does not support hair growth. 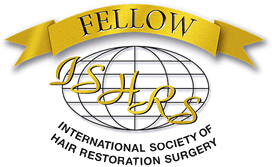 Hair follicles can be successfully transplanted into scar tissue and result in living and growing hair. 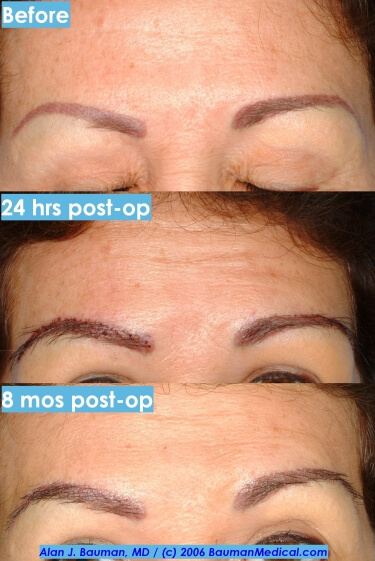 Eyebrow transplantation is performed under comfortable local anesthesia and takes a few hours. Careful, accurate planning and meticulous implantation is required to obtain the correct angle, orientation and position of the transplanted follicles so the resulting growth blends naturally. The resulting transplanted hair needs to be trimmed every six to eight weeks. The “after“ photos in Jonathan’s case were taken 18 months post-operatively. Click here for more eyebrow transplant photos. Similar techniques can be used to cover scars on the scalp from trauma or surgical procedures (like neurosurgery or plastic surgery). Dr. Bauman is often asked to perform post-plastic surgery hair transplantation to cover scars and hair loss from browlifts and facelifts. Hair loss in the sideburns, temples, around the ear, on the back of the neck, etc. 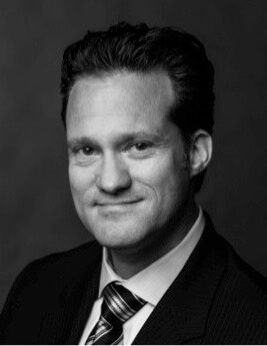 can be covered using Dr. Bauman’s advanced hair transplantation techniques. The eyebrow transplant procedure can be used to restore living and growing follicles into the eyebrow area. Eyebrow loss can occur in both men and women, and is most commonly due to injury, trauma, overplucking or aging. 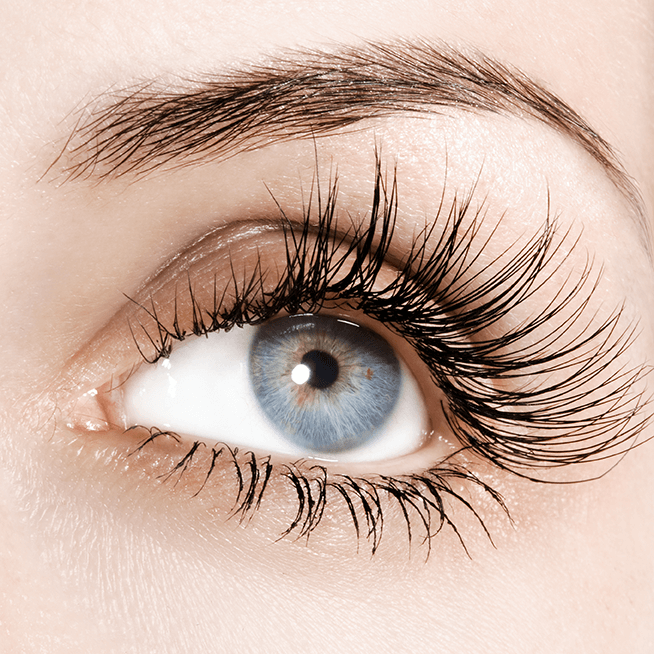 Under comfortable local anesthesia (using the FDA-appoved Ouchless Needle), scalp hair follicles are moved one-at-a-time into the eyebrow area. Artistic planning and meticulous angulation of each hair is critical to the naturalness of the final result. After several days of healing, the eyebrow skin returns to normal and the transplanted follicles are dormant. Hair will begin to appear first as stubble, starting approximately 6-12 weeks later growing longer and more dense as the weeks go by. The final ‘result’ of an eyebrow transplant takes 8-10 months to grow in*. The transplanted hairs will need to be routinely trimmed. 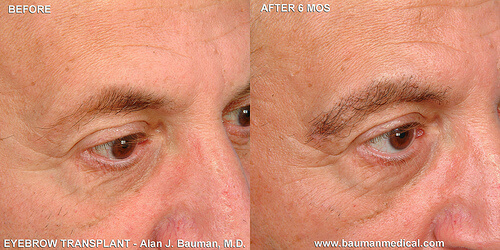 NEW: Eyebrow transplants by Dr. Alan Bauman can now be performed with the no-scalpel/no-stitch harvesting technique called NeoGraft FUE for quicker and more comfortable recovery. 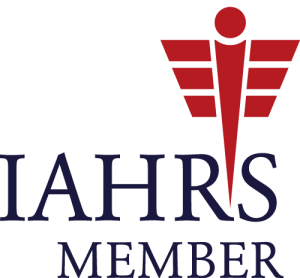 Depending on the desired degree of coverage some patients typically require one or two procedures. 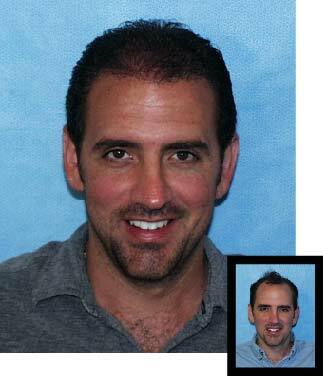 Dr. Alan Bauman has performed eyebrow transplantation as a routine part of his full-time hair restoration practice. 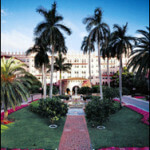 For more information, please email Dr. Bauman directly at Email Dr. Bauman. Not just a phenomenon in women, eyebrow loss is being noticed increasingly in men. Eyebrow transplantation can be used to restore a more natural shape and density to male eyebrows. 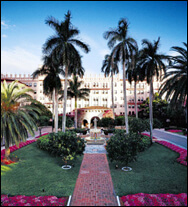 Loss can occur due to trauma and illness, as well as aging. 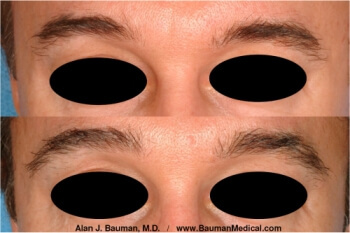 The photo below shows the result of eyebrow transplantation in a male patient, performed by Dr. Bauman. The patient was concerned about a shortening of the length of his brows (loss of the outer, lateral ends), as well as a loss of density. Notice the improvement in density as well as the improved shape, especially toward the outer edges of the brows following the transplant procedure. The photos were taken ‘before’ and twelve months ‘after’ a single session of eyebrow transplantation. 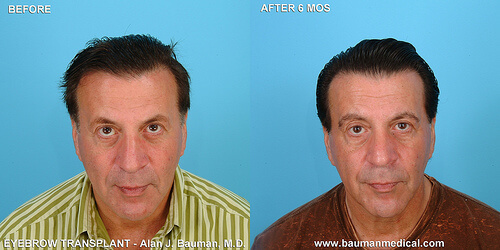 For more information on eyebrow transplantation, email Email Dr. Bauman click here for a larger male eyebrow transplant photoHere is another example of results from a Male Eyebrow Transplant. This result is seen after six months and will continue to improve over the next few months. Already, you can see the improvement in the density and shape of the brow area. Eyebrow transplantation can now be performed using the minimally-invasive, no-scalpel, no-stitch harvesting approach called NeoGraft FUE. NeoGraft allows individual follicles or follicular units to be harvested without leaving a linear scar and with a shorter, more comfortable healing phase. Dr. Bauman has harvested hundreds of thousands of follicles using the NeoGraft FUE procedure for scalp hair, eyebrows and other restorations of living and growing hair. See how eyebrow transplantation affects the eyebrow area… a more youthful, aesthetic ‘frame’ to the eye area is seen with the restoration of the eyebrow.